1. Karmali, M.A. Infections by verocytotoxin-producing 15. Escherichia coli. Clin. Microbiol. Rev. 1989, 2 (1), 1538. 2. Nataro, J.P.; Kaper, J.B. Diarrheagenic Escherichia coli. Clin. Microbiol. Rev. 1998, 11 (1), 142-201. 3. O'Brien, A.D.; Holmes, R.K. Shiga and Shiga-like toxins. 16. Microbiol. Rev. 1987, 51 (2), 206-220. 4. Paton, J.C.; Paton, A.W. Pathogenesis and diagnosis of Shiga toxin-producing Escherichia coli infections. Clin. Microbiol. Rev. 1998, 11 (3), 450-479. 17. C.L. Growing concern and recent outbreaks involving non- 18. O157:H7 serotypes of verotoxigenic Escherichia coli. J. Food Prot. 1996, 59 (10), 1112-1122. 6. Monday, S.R. ; Whittam, T.S. ; Feng, P.C.H. Genetic and 19. evolutionary analysis of mutations in the gusA gene that cause the absence of ß-glucuronidase activity in Escherichia coli O157:H7. J. Infect. Dis. 2001 Oct, 184, 918921. 20. 7. Karch, H.; Bielaszewska, M. Sorbitol-fermenting Shiga toxin-producing Escherichia coli O157:H-strains: Epidemiology, phenotypic and molecular characteristics, and microbiological diagnosis. J. Clin. Microbiol. 2001, 39 (6), 2043 -2049. 8. Bastian, S.N. ; Carle, I.; Grimont, F. Comparison of 14 PCR 21. systems for the detection and subtyping of STX genes in Shiga-toxin-producing Escherichia coli. Res. Microbiol. 9. Boerlin, P.; McEwen, S.A.; Boerlin-Petzold, F.; Wilson, 22. J.B.; Johnson, R.P. ; Gyles, C.L. Association between virulence factors of Shiga toxin-producing Escherichia coli and disease in humans. J. Clin. Microbiol. 1999, 37 (3), 497-503. 10. Zhang, W.L. ; Kohler, B.; Oswald, E.; Beutin, L.; Karch, 23. H.; Morabito, S.; Caprioli, A.; Suerbaum, S.; Schmidt, H. Genetic diversity of intimin genes of attaching and effacing Escherichia coli strains. J. Clin. Microbiol. 11. Adu-Bobie, J.; Frankel, G.; Bain, C.; Goncalves, A.G.; 24. Trabulsi, L.R. ; Douce, G.; Knutton, S.; Dougan, G. Detection of intimins a, ß, g, and ct, four intimin derivatives expressed by attaching and effacing microbial pathogens. J. Clin. Microbiol. 1998, 36 (3), 662-668. Boerlin, P.; Chen, S.; S.A.; Colbourne, J.K.; Johnson, R.P. ; De Grandis, S.; Gyles, C.L. Evolution of enterohemorrhagic Escherichia coli hemolysin plasmid and the locus for enterocyte effacement in Shiga toxin-producing E. coli. Infect. Immun. 1998, 66 (6), 2553-2561. Brunder, W.; Schmidt, H.; Frosch, M.; Karch, H. The large plasmids of Shiga-toxin-producing Escherichia coli (STEC) are highly variable genetic elements. Microbiology 1999, 145, 1005-1014. Jenkins, C.; Perry, N.T. ; Cheasty, T.; Shaw, D.J. ; Frankel, G.; Dougan, G.; Gunn, G.J. ; Smith, H.R. ; Paton, A.W. ; Paton, J.C. Distribution of the saa gene in strains of Shiga toxin-producing Escherichia coli of human and bovine origin. J. Clin. Microbiol. 2003, 41 (4), 1775-1778. Feng, P.; Monday, S.R. Multiplex PCR for detection of trait and virulence factors in enterohemorrhagic Escherichia coli serotypes. Mol. Cell. Probes 2000, 14, 333337. Bilge, S.S.; Vary, J.C., Jr.; Dowell, S.F. ; Tarr, P.I. Role of the Escherichia coli O157:H7 O side chain in adherence and analysis of an rfb locus. Infect. Immun. 1996, 64 (11), 4795-4801. Batin, D.A. ; Reeves, P.R. Sequence analysis of the O antigen gene (rfb) cluster of Escherichia coli O111. Gene 1995, 164, 17-23. Paton, A.W. ; Paton, J.C. Direct detection of shiga toxigenic Escherichia coli strains belonging to serogroup O111, O157, and O113 by multiplex PCR. J. Clin. Microbiol. 1999, 37 (10), 3362-3365. Fields, P.I. ; Blom, K.; Hughes, H.J. ; Helsel, L.O. ; Feng, P.; Swaminathan, B. Molecular characterization of the gene encoding H antigen in Escherichia coli and development of a PCR-restriction fragment length polymorphism test for identification of E. coli O157:H7 and O157:NM. J. Clin. Microbiol. 1997, 35 (5), 1066-1070. Ratiner, Y.A. 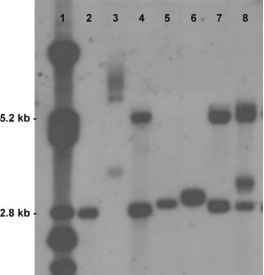 ; Salmenlinna, S.; Eklund, M.; Keskimaki, M.; Siitonen, A. Serology and genetics of the flagella antigen of Escherichia coli O157:H7a,7c. J. Clin. Micro-biol. 2003, 41 (3), 1033-1040. Gannon, V.P.J. ; D'Souza, S.; Graham, T.; King, R.K.; Rahn, K.; Read, S. Use of the flagellar H7 gene as target in multiplex PCR assays and improved specificity in identification of enterohemorrhagic Escherichia coli strains. J. Clin. Microbiol. 1997, 35 (3), 656-662. Paton, A.W. ; Paton, J.C. Detection and characterization of Shiga toxigenic Escherichia coli by using multiplex PCR assays for stx1, stx2, eaeA, enterohemorrhagic E. coli hlyA, rfbO111 and rfbO157. J. Clin. Microbiol. 1998, 36 (2), 598-602. Reischl, U.; Youssef, M.T. ; Kilwinski, J.; Lehn, N.; Zhang, W.L. ; Karch, H.; Strockbine, N.A. Real-time fluorescence PCR assays for detection and characterization of Shiga toxin, intimin, and enterhemolysin genes from Shiga toxin-producing Escherichia coli. J. Clin. Microbiol. 2002, 40 (7), 2555-2565. Wang, G.; Clark, C.G. ; Rodgers, F.G. Detection in Escherichia coli of the genes encoding the major virulence factors, the genes designing the O157:H7 serotype, and components of the type 2 Shiga toxin family by multiplex PCR. J. Clin. Microbiol. 2003, 40 (10), 3613-3619.